We are people of all ages. We are a loosely connected group of Pittsburgh residents and merchants who are passionate about picking up litter in our neighborhoods. We are involved in the Redd Up Pittsburgh movement. Active since March 2005, our band of volunteers is making a big impact. Streets, gutters, sidewalks, grassy places and alleys are cleaner. We started in Shadyside, but our reach goes far beyond Walnut Street. What we accomplish here can be replicated in other neighborhoods throughout Pittsburgh. 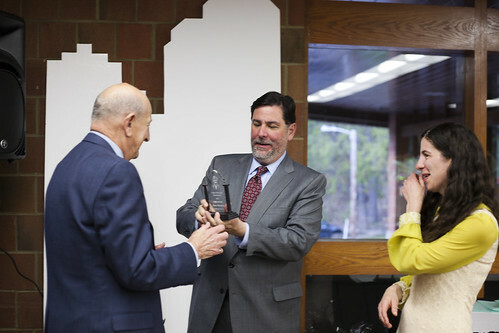 May 1, 2014: Mayor Peduto presents Boris Weinstein with a Bob Award for his lifetime of service to the City of Pittsburgh. Photo by Daniel Buczynski. If a picture's worth a thousand words, then we have a lot to say. Check back often, or visit our photo collection for more pictures of litter, and, when things go right, maybe even some glitter. Do you know of a trouble spot that you'd like to highlight? Snap a picture and mail it to us. Only by identifying the problem can we begin to solve it. The Spring/Earth Day Redd Up is April 21, 22 & 23. We hope you have time to put our event on your calendar. We urge you to sign up your community...and recruit your volunteers, organize your event (like always) and execute to continue to make our Pittsburgh area one of the cleanest places in America. Illegal signs in Penn Hills are "overwhelming"